I started sweet basil from seed this spring so I would have plenty for freezing to brighten up meals in the winter. I tucked it away in various garden locations when it was still a bit too cold for basil and then forgot it. Thankfully, at least 2 plants made it. They’re small but particularly beautiful and fresh looking. 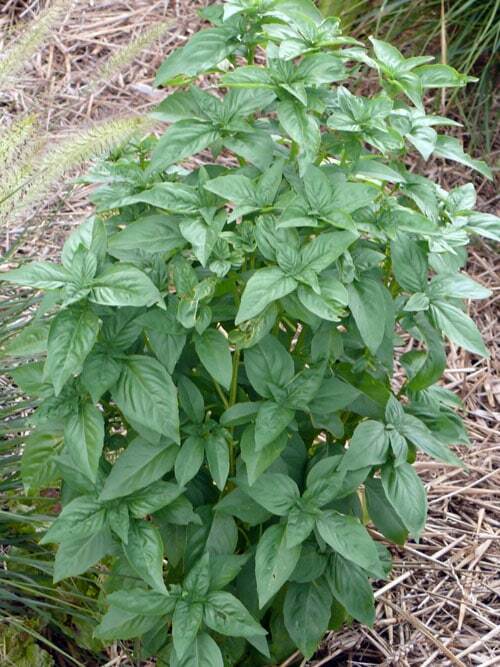 Sweet basil in my garden still looking fresh in August and September. When I rediscovered the basil, I had to celebrate by using some for dinner. I didn’t feel like making pesto per se —- but I used pesto ingredients to make a dish with organic whole wheat flat noodles. This is the kind of recipe that you can easily change around to suite your own tastes. You might want to try it my way first and then make changes the next time. I think you’ll find the flavor very delicate and enjoyable. Ingredients for Pasta with Pesto (Sort of) — Serves 2 to 4 as a main dish meal. Serves 4 to 6 as a side dish. Put chopped garlic in an oiled stainless steel skillet. Turn heat to medium and let garlic heat and start to sizzle. Lower heat. Then add chopped walnuts and distribute over the entire bottom of the skillet. Let them ‘roast’ just a little. Careful with the heat. You want the garlic and walnuts just slightly roasted, not burned. Then remove the pan from heat. 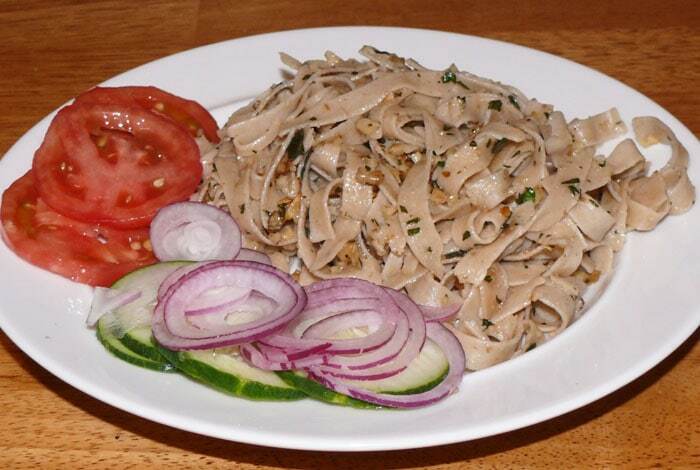 Place drained whole wheat noodles in the skillet on top of the garlic and walnut mixture. In a small bowl stir chopped basil and about 2 or 3 tablespoons of oil. Spread this mixture over top of the noodles in the pan. Gently toss/mix with utensils until all ingredients are distributed throughout the noodles. Optional: With a fork take a patty of butter and rub over the top of individual servings. I served mine with fresh tomatoes, thinly sliced cucumbers and red onions from the garden. The cucumbers and onions had a splash of white wine vinegar on them and a dash of salt. Fresh sweet basil is the important ingredient in this Pasta dish. Has a delicate taste and not overwhelming at all. If you have fresh cherry tomatoes, you could cut them in half and lightly toss about a cup full into the noodles. A leaf of fresh basil would have been perfect to top of the looks of this plate. I don’t know why I didn’t think about it until it was too late. This recipe would be great in the cold of winter. Chop your basil now and mix it with oil and freeze. You’ll be ready this winter to have a dish that reminds you of summer. So easy, and it looks delicious. I freeze tons of pesto and we are using up the last of it now, but this is very nice and fresh – and no blender or food processor clean up! Nice to have you comment on one of my recipes. I stopped putting up recipes because I came to believe Bill and I eat too simply for most people’s taste. No sense in writing them up, if no one is interested. And yes, this is so easy and we thought — delicious. Theresa, your recipe is a hit with my girls! I tried this last week and today my daughter (6 years) who is going to have her friend over for a playdate asked if I could make this :-). Aparna, I am delighted that you like this recipe and especially thrilled that your 6 year old asked you to make it again! Wow! Now that’s impressive. I am growing basil this season after we tried your recipe. Now I think I have more than I could use, so was looking for a recipe to freeze some. Just reading your post here again and found what I needed on the last few lines. Hmmm chopped basil and olive oil it can’t get any simpler than that! I love it. That’ll come in handy this winter Aparna! Please don’t stop posting recipes. We eat simply, also. I’m still trying to get my husband & son to eat more meatless meals. They are both such hearty eaters that they will eat 3 to 4 different veggies & at least 2 huge grilled deer burgers each! My entertainment while I eat my veggies is watching them get it all down! When folks are born and raised meat-eaters — it’s hard for them to make the change, Betty. I know because Bill and I were both like that. When a person first starts cutting back on meat they wonder what there is to eat. This is the first year that I have not bought pesto, eaten ONLY home made pesto made from home grown basil, thanks to you. I’m just about to make another batch with olive oil and basil and freeze for winter. That is down right exciting Aparna! This winter when you reach for that frozen pesto that tastes like it’s fresh from the garden — you’ll be even more pleased! Thanks for sharing the news. Keep me posted on the great things you’re doing.